Gallup Park is a 69-acre park and is Ann Arbor's most popular recreation area. It is located along the Huron River and Geddes Pond with scenic walkways that traverse small islands with bucolic pedestrian bridges. The park contains two playgrounds, a canoe livery, picnic areas and grills scattered throughout the park, two picnic shelters, open field for play, and over three miles of asphalt trails that are popular for biking, rollerblading, walking and running. Two drinking fountains and many benches allow the park user to take respite from their recreational activities. There are four parking areas: one at the main entrance off Fuller Road, two within the park along the park drive, and one further southeast on Geddes Road. As you will see from the photos here, Gallup Park is a fantastic park to bike, walk around or run/jog. It has a great mixture of scenic Huron Riuver views, paved trails, wood plank trails (boardwalk), woodchip trails, dirt trails, woods trails, bridges, and a hummingbird garden. This park, and Ann Arbor is general, is a city with many health and fitness-oriented people and you will find them here all year walking and jogging. There is a bike path that follows the river and you can also rent both single and double kayaks, paddle boats, and canoes at the livery in the park. Among the photos included here are shots of local rowinng teams practicing in the wide sections of the river. If you drive along the river west through Ann Arbor and into Dexter you will pass many other parks as well as other individuals and families kayaking down the river for miles and miles. The park has several picnic shelters, restrooms, and observation decks for fishing, but does not include sports fields. However, there are numerous soccer and baseball fields a mile west down Fuller Road at Fuller Park. Gallup Park was designed a more of a nature, walking, biking, jogging, fishing, and boating park. The park also hosts several annual events. The Huron River Day at the beginning of July, an event designed to acknowledge the importance of the river and the role it plays in the community through numerous displays, contests and events. The Ann Arbor Blues and Jazz Festival also rocks Gallup Park for two days in September. Among the photos here of Gallup Park, photos of the Furstenberg Nature Area are also included (those with the wood plank - boardwalk - and dirt trails). Furstenberg Nature Area can be accessed from within Gallup Park via a pedestrian bridge on your right as you drive into the park (there is a sign in front of it - see photos 7, 8, 9, etc. in Gallery #1). Furstenberg Nature Area is a 38-acre park containing wetlands, woodlands, prairie, and oak savannah. It includes a half-mile paved trail loops through the park, and a granular trail goes through the prairie and woods, connecting to 1/4 mile of wetland boardwalk. Facilities include a paved parking lot, a restroom building, picnic tables, two wetland overlooks, benches, and interpretive signage. An interpretive brochure leads the visitor through a series of numbered posts explaining the natural ecosystems. Bike riding on the boardwalk is prohibited. The land that is now Furstenberg Park was owned by Huron Farms Company (later succeeded by Detroit Edison) until 1939. It was then purchased by Albert and Elizabeth Furstenberg. 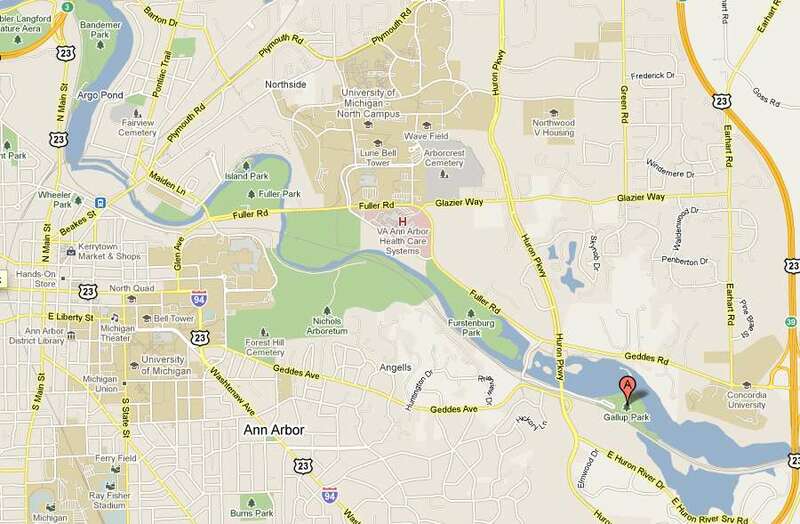 In 1971 the area was acquired for $90,000 by the City of Ann Arbor to "preserve and protect the Huron River Valley". The purchase was financed with a H.U.D. Open Space Grant for use as "park purposes." The land was largely undeveloped as a park through the 1980s. In 1986 it was even used by the City for clean fill dumping. In 1992, several improvements including trails, benches, and a marker were added with the support of private donations toward the Dr. Edward O. Gilbert memorial fund. In 1993, a major grant was acquired from the Michigan Department of Natural Resources to preserve the river frontage. These improvements were implemented in two phases and included a boardwalk, restrooms, parking, and a bridge connecting Furstenberg to adjacent Gallup Park. The bridge officially opened in 1996. The landscape architect who designed these improvements, Peter Pollack of Pollack Designs in Ann Arbor, was given an award from the American Society of Landscape Architects for his design. (reference: Furstenberg Nature Area web site). Gallup Park is an important connector on the Border-to-Border Trail. The Huron River winds through approximately 35 miles of Washtenaw County. THe Border-to-Border Trail (B2B) represents an ongoing collaboration of communities and organizations to construct a shared-use path that will link the open spaces of the Huron River greenway. Within its County Greenways Initiative, the Washtenaw County Parks and Recreation Commission has made a serious committment to expand hike and bike trails throughout the county, adn the B2B trail is WCPARC's major development project to achieve this goal. 10+ miles of paved paths exist today with 25 miles more to come. Click here to download a PDF brochure on the B2B trail.